The burial ceremony for at least 775 victims will be held on 11 July, 2010, in Potocari, on the 15th anniversary of the Srebrenica genocide when Bosnian Serb forces stormed the enclave, expelled 30,000 and systematically killed more than 8,000 Bosniaks - men, boys, and elderly. Many women and girls were brutally raped by Serb soldiers. #1. Bosnian forensic technicians track and log remains of the Srebrenica genocide victims after a positive identification at ICMP (International Commission on Missing Persons) facility in Tuzla, on June 30, 2010. 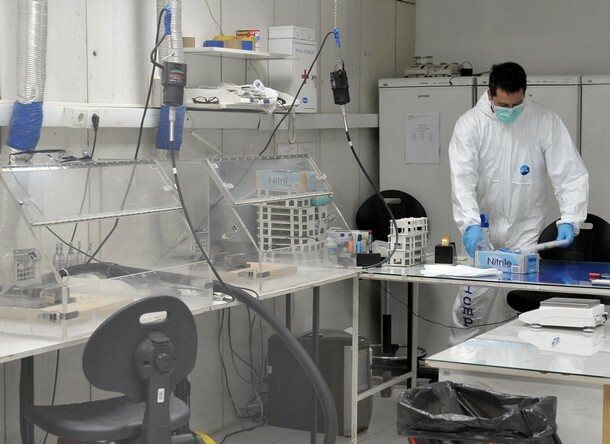 Bosnia is a global leader in the science of DNA-identification. 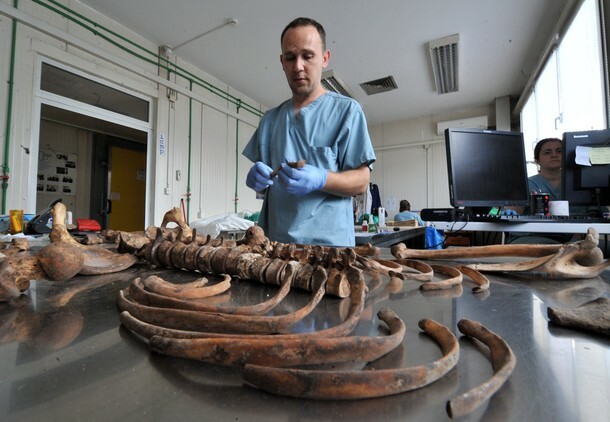 The remains are shiped off to another civilian mortuary to be prepared for mass burrial ceremony scheduled on July 11, at the Srebrenica Genocide Memorial in Potocari. This year's mass burrial, marking the 15th anniversary of the fall of Srebrenica, is organised for at least 775 bodies that were positively identified using reliable forensic methods in the past 12 months. (Background shows shelves with individual remains still waiting for forensic processing). #2. Bosnian athroplogist atempts to re-associate remains of a Srebrenica genocide victim in preparation for identification at ICMP (International Commission on Missing Persons) facility in Tuzla, on June 30, 2010. #3. 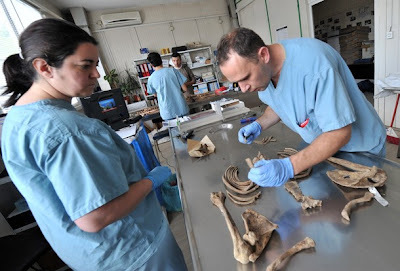 Bosnian athroplogists re-associate remains of a Srebrenica genocide victim in preparation for identification at ICMP (International Commission on Missing Persons) facility in Tuzla, on June 30, 2010. #4. Bones of Srebrenica genocide victims in preparation for DNA identification at the ICMP (International Commission on Missing Persons) facility in Tuzla, on June 30, 2010. 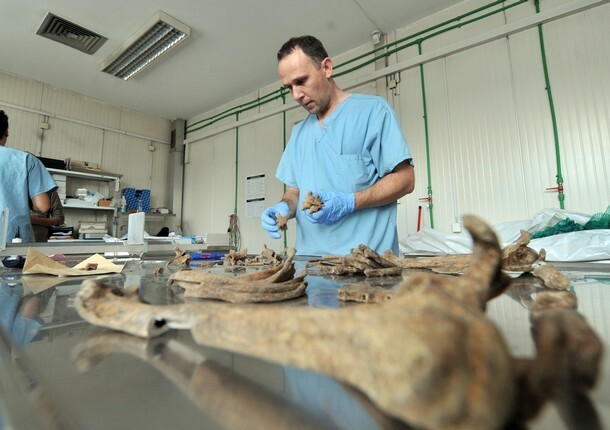 Bosnian forensic scientists attempt to re-associate remains of Srebrenica genocide victims. #5. 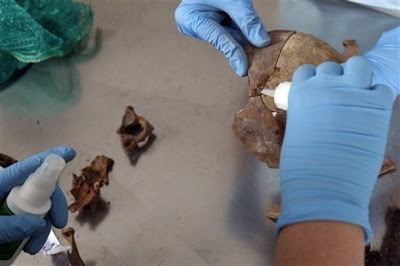 Forensic experts of the International Commission for Missing Persons ICMP, compare bones during process of collating body remains exhumed from mass graves and identified by DNA , in the identification center in Tuzla, 80 kms north of Sarajevo, Bosnia, on Wednesday, July 7, 2010. #6. 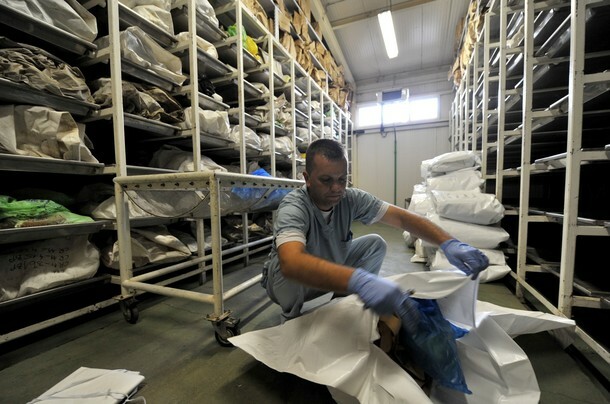 Bosnian laboratory technician works in laboratory matching data with samples for remains of Srebrenica 1995 victims in preparation for identification at ICMP (International Commission on Missing Persons) facility in Tuzla, on June 30, 2010. #7. 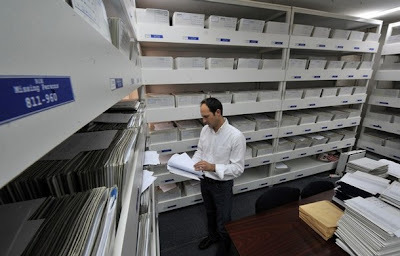 A Bosnian worker looks at the documentation on processed blood samples in an atempt to find DNA link with excavated remains at ICMP (International Commission on Missing Persons) facility in Tuzla, on June 30, 2010. 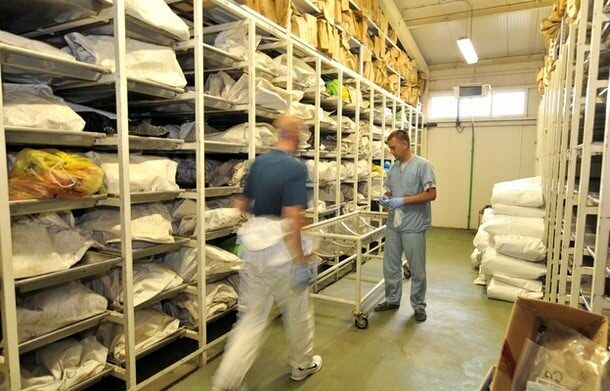 After identification, the remains are shiped off to another civilian mortuary to be prepared for mass burrial ceremony scheduled on July 11, at the Srebrenica Genocide Memorial in Potocari. #8. Forensic experts of the International Commission for Missing Persons ICMP, cement together parts of a human skull during the process of collating body remains exhumed from mass graves and identified by DNA , in the identification center in Tuzla, 80 kms north of Sarajevo, Bosnia, on Wednesday, July 7, 2010. #9. Bosnian worker Mirza Dautovic checks name tags on some of 775 coffins at city morgue in central-Bosnian town of Visoko, Tuesday, July 6, 2010. Coffins of identified Srebrenica victims prepared to be transported and buried at their final resting place at memorial cemetery in Potocari near Srebrenica. 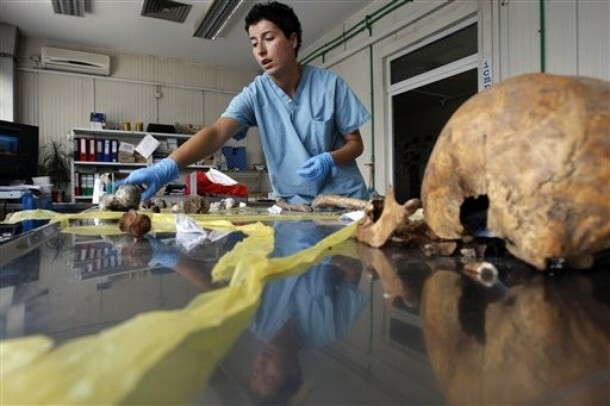 All 775 bodies were excavated from mass graves in Eastern-Bosnia and identified by teams of local and international forensic experts. #10. Bosnian forensic technician packs remains of a Srebrenica genocide victim after a positive identification at ICMP (International Commission on Missing Persons) facility in Tuzla, on June 30, 2010. The remains are shiped off to another civilian mortuary to be prepared for mass burrial ceremony scheduled on July 11, at the Srebrenica Genocide Memorial in Potocari. #11. 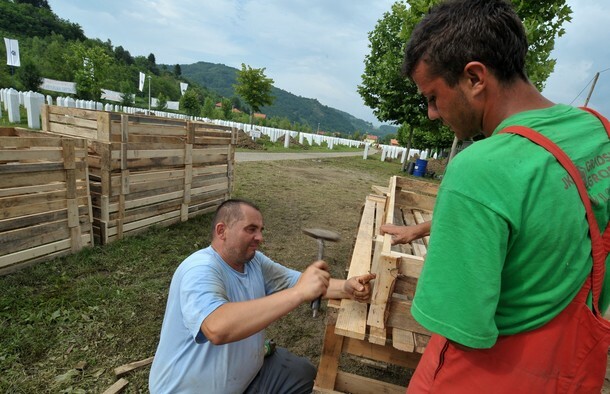 Bosnian workers prepare wooden supports for burrial sites at Srebrenica Memorial Cemetary in Potocari, on June 30, 2010, for mass burrial ceremony scheduled on July 11, 2010. #12. Bosnian workers prepare burrial sites at Srebrenica Memorial Cemetary in Potocari, on June 30, 2010, for mass burrial ceremony scheduled on July 11, 2010. #13. 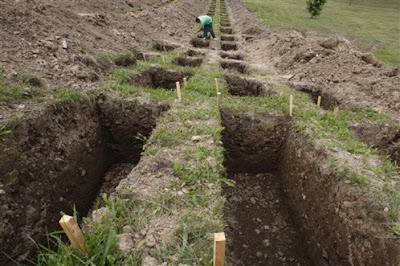 Bosnian workers prepare graves during preparation for mass burial at the memorial centre for Srebrenica victims in Potocari, near Srebrenica 120 kms northeast of Bosnian capital of Sarajevo, on Wednesday, July 7, 2010. #14. Bosnian worker inspects graves during preparation for mass burial at the memorial centre for Srebrenica victims in Potocari, near Srebrenica 120 kms northeast of Bosnian capital of Sarajevo, on Wednesday, July 7, 2010. 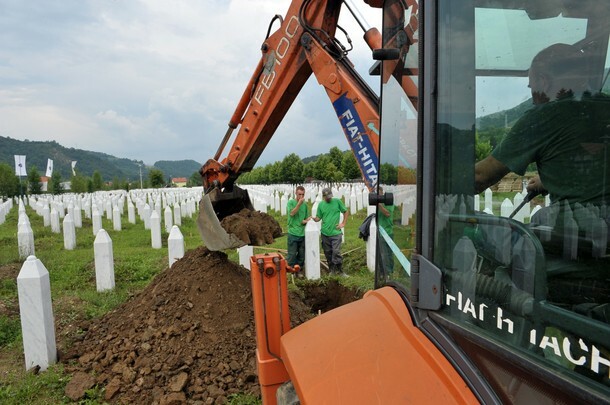 The burial ceremony for at least 775 victims will be held on 11 July, 2010, in Potocari, on the 15th anniversary of the Srebrenica genocide when Bosnian Serb forces stormed the enclave, expelled 30,000 and systematically killed more than 8,000 Bosniaks - men, boys, and elderly. Many women and girls were brutally raped by Serb soldiers.